დაარსდა 1865 წელს და განკუთვნილი იყო სამოქალაქო ომში დაღუპული ჯარისკაცებისთვის. ტერიტორიის ნაწილი, რაზეც განთავსებულია სასაფლაო, ჩამოართვეს გენერალ რობერტ ედვარდ ლის — სამხრეთ არმიის მთავარსარდალი სამოქალაქო ომში. (March 2013) Arlington National Cemetery Millennium Project Environmental Assessment. Norfolk, Virginia: United States Army Corps of Engineers Norfolk District. წაკითხვის თარიღი: March 12, 2013.
შეგიძლიათ იხილოთ მედიაფაილები თემაზე „არლინგტონის ნაციონალური სასაფლაო“ ვიკისაწყობში. ↑ 1.0 1.1 Davenport, Christian. 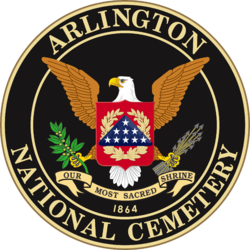 "Arlington Cemetery Trying to Account for Missing $12 Million." Washington Post. 25 იანვარი, 2012.
ეს გვერდი ბოლოს დარედაქტირდა: 21:14, 22 მარტი 2018.